In yesterday’s devotion I highlighted the world’s need for a shepherd and the opportunity God has given us to provide shepherd-like leadership amidst all kinds of crises. Today I want to emphasize our own personal need for the Good Shepherd, especially as we seek to meet the needs around us. Just as I was beginning to write these words, my 2-year-old daughter cried out to me as she does every morning when she awakes, “Daddy! Daddy!” Though she is too young to know exactly what a shepherd is, in many ways I am her shepherd. Jesus says he would lay his life down for us and I certainly know that I would be willing to give my life for my children if that were necessary. This is the natural instinct of a good parent and the never-fading commitment of our God toward us, his beloved children. The late Brennan Manning, when asked about the Apostle John said, “If John were to be asked, ‘What is your primary identity in life?’ he would not reply, ‘I am a disciple, an apostle, an evangelist, an author of one of the four Gospels,’ but rather, ‘I am the one Jesus loves.’” Could I say that? Could you? Why is it important for leaders to remember each day that our primary identity is as one whom Jesus loves? Because if we don’t then we will find our identity and value mainly in what we do, not in who we are in relationship to God. In the Gospel of John, Jesus says that we are the dependent sheep who have a Good Shepherd, One who has laid down his life for us. Jesus not only did this willingly, but also joyfully. Hebrews 12:2 curiously proclaims, “For the joy set before him, Christ endured the cross.” How could the cross be a joy? Like the shepherd Jesus describes in Luke 15, Jesus’ joy as the Good Shepherd is having his sheep once again resting on his shoulders, safely in his care and secure in his presence. He rescued us from sin and death through his death on the cross. As leaders, we are tasked to perform well and I believe that God has gifted and resourced us to do so. But God never intended us to find our core identity in anything but belonging to him. We are his sheep and he is our Shepherd. So, let’s lead well knowing we are forever loved by the God who is also our Good Shepherd. Let’s face the crises of the week knowing that we do not face them alone and that our value isn’t based on our success, but on God’s love for us. When a crisis arises in the contexts in which you lead, do you naturally turn to Jesus as one who can shepherd you through the inevitable conflict and pain? 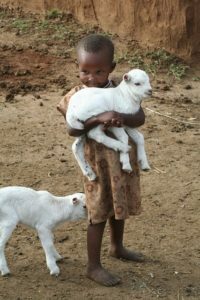 Is the image of a parent and child a helpful metaphor for you to understand the Lord as our Good Shepherd? Do you more readily find your identity as one deeply cared for by the Good Shepherd or as one who must perform well to be loved and accepted? How do you best connect with this God of love who wants his leaders to rest in him? God, thank you for being our Shepherd. When we think we must perform in order to be loved, remind us that you endured the cross for our sake regardless of our good or bad performance. Help me to comprehend more fully the joy you have in finding me, securing me, and living in me. Empower me with your Spirit, who gives me the confidence to lead and the humility to depend on you. There is nothing I can do apart from you, Lord, so I choose to rest in your love and grace as I serve the people you’ve called me to lead. Amen.